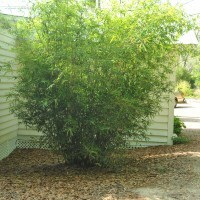 Clumping bamboos make excellent, fast-growing, evergreen hedges or specimen plants. In Zones 8b and above, they are the fastest growing and most attractive option for an evergreen privacy screen, windbreak, or noise/dust barrier. Some are also well suited to container gardening or decorative planters. 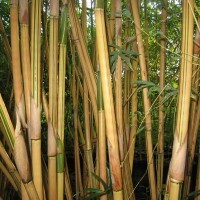 Unlike the running bamboos, they do not need containment when planted in the ground and will not escape from containers. 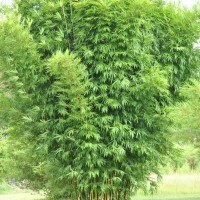 Clumping bamboos grow quickly and may reach mature height in 4-6 years under optimal growing conditions. By contrast, the running bamboos generally spend their first 2-3 years establishing their rhizome (root) system and don’t really begin to show much above-ground growth before year 3 or 4. 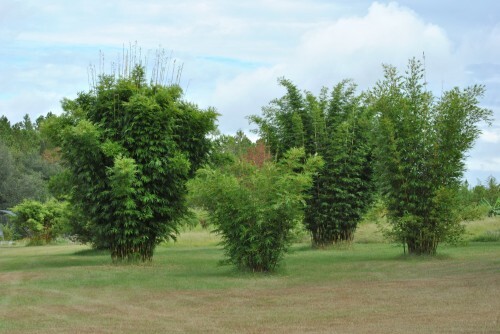 The clumping bamboos that will grow in our Southwest Georgia (USDA Zone 8b), coastal plain climate are mostly subtropical clumping varieties. The most cold-hardy of these are the Bambusa multiplex and Bambusa textilis varieties, evergreen to around 12 and 15 degrees F, respectively. A new addition to our collection and one that we are watching closely is Fargesia dracocephala ‘Rufa’, a clumping bamboo that is evergreen to –5F. While most of the Fargesias suffer in the humid South, ‘Rufa’ has so far shown no ill effects. This appears to be the bamboo for those who live in the South and want a clumping variety, but are too far north to grow the Bambusas. Our work involves continuously researching and acquiring new clumping bamboo species and evaluating them for suitability to our climate. Some of our favorites are semi-evergreen or deciduous here, but worth growing as perennials because of their beautiful, lush foliage and tropical look. Please see individual species descriptions for performance notes. 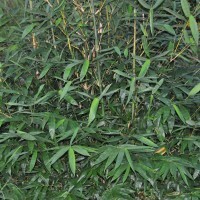 The maximum height, maximum cane diameter, and minimum temperature specifications given for individual bamboos are not absolutes. Maximum height and cane diameter listings are approximations of the potential of a given bamboo under optimal conditions. In most situations, a given bamboo will not attain these numbers. The minimum temperature listed is an approximation of the temperature at which leaf damage will begin to occur on a well-established bamboo (first-year plantings usually exhibit less cold-hardiness). Below this temperature, the bamboo may suffer moderate to severe foliage damage, becoming partially or completely deciduous. Usually a given bamboo will survive temperatures well below those listed, generating new foliage and shoots during the subsequent growing season. Protected microclimates along with good cultural practices often allow a given bamboo to remain evergreen several degrees below its “minimum temperature.” Regarding the sunlight requirements, this may vary across regions, and is intended only as a general guide. 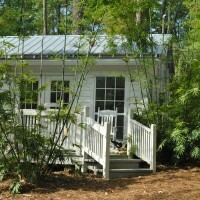 Except where personal experience has indicated discrepancies, the figures listed here are taken from the American Bamboo Society’s specifications. Seabreeze Bamboo Bambusa malingensis 35 2.5 18 5 A medium-sized tropical, Malingensis makes the perfect screen where it is hardy. This bamboo is semi-evergreen in our area but is quicker to recover than some of the other less hardy species. Hardiness zones 9 and above; perennial in zone 8. Hedge Bamboo Bambusa multiplex 25 1.5 12 5 Bambusa multiplex and the several multiplex varieties are possibly the most cold-hardy of the subtropical clumpers. All multiplex varieties are excellent screening plants, each with its own distinct characteristics (see varietal descriptions). The species type is the largest of the all-green forms of multiplex. Hardiness zones 8b and above. Alphonse Karr Bambusa multiplex ‘Alphonse Karr’ 25 1.5 12 5 Alphonse Karr is the most popular of the multiplexes and more erect than the species. Its popularity is due to its bright yellow canes with random green striping. New shoots and canes often have a pinkish hue. As with all of the multiplexes, it is great for use as a hedge or may be planted as a specimen. For specimen plantings, we recommend growing Alphonse Karr in light shade as this will cause the branches to begin higher on the canes, allowing the beautiful colors and striping to be seen. Hardiness zones 8b and above. Golden Goddess Bambusa multiplex ‘Golden Goddess’ 10 0.5 12 5 Golden Goddess is a popular ornamental and great for a shorter hedge. Similar to ‘Fernleaf’, but with slightly larger leaves. Canes become golden with age and sun exposure. Hardiness zones 8b and above. Chinese Goddess Bambusa multiplex ‘Riviereorum’ 6 0.3 12 5 Similar to ‘Fernleaf’ and ‘Golden Goddess’, but smaller and with solid canes. Hardiness zones 8b and above. Silverstripe Hedge Bamboo Bambusa multiplex ‘Silverstripe’ 30 1.5 12 5 Silverstripe is the largest of the multiplexes and is also reputed to be the most cold-hardy. Spring foliage is highly variegated, fading to mostly green through summer and fall. Many of the canes also have beautiful silver striping. 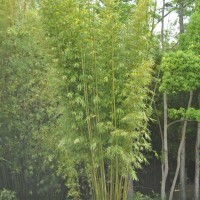 Silverstripe is a very beautiful but underrated bamboo that is great for screening or as a specimen plant. Best choice for a large privacy screen in zone 8b. Hardiness zones 8b and above. Tiny Fern Bambusa multiplex ‘Tiny Fern’ 8 0.2 12 5 Tiny Fern is a dwarf form of ‘Fernleaf’, with delicate, finely textured foliage. This is another underrated bamboo that deserves wider use. Great for short hedges or as a specimen plant. 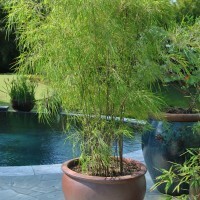 Good choice for smaller gardens where larger bamboos won’t work. Tiny Fern is the shortest of the multiplex varieties. Hardiness zones 8b and above. Willowy Bambusa multiplex ‘Willowy’ 10 0.5 12 5 Emerald green canes droop or arch strongly, giving this bamboo a wide stance. Great choice for a low privacy screen/hedge. Hardiness zones 8b and above. Oldham’s Bamboo Bambusa oldhamii 55 4 18 5 Oldhamii is the most common giant tropical bamboo grown in the U.S. A very beautiful bamboo, we are still waiting to see how it will size up here. Our specimen experiences complete die-back around 18F on an exposed planting site. We have seen it remain semi-evergreen at the same temps in more protected microclimates. Worth growing as a perennial for its beautiful, tropical foliage – our established planting recovers quickly to 15+ feet every summer. Not recommended for a reliably evergreen privacy screen in zone 8, but highly recommended as a tropical perennial. Weaver’s Bamboo Bambusa textilis 40 2 15 5 Textilis is one of the most beautiful clumping bamboos and also one of the most cold-hardy subtropical species. All textilis varieties form tight, erect clumps and are a great choice for screens where a strong vertical look is desired or needed due to a narrow planting site; textilis does not weep outwards at the top like the multiplex varieties. The textilis varieties also make great specimen plants due to their elegant, refined look and tropical foliage. Mature plants will be branchless on the lower 1/3-1/2 of the canes. Hardiness zones 8b and above. Silk Bamboo Bamsusa textilis ‘Glabra’ 30 1 15 5 ‘Glabra’ has a more open clumping habit than other textilis varieties. Makes a beautiful specimen plant! Hardiness zones 8b and above. Graceful Bamboo Bambusa textilis ‘Gracilis’ 30 1.3 15 5 Designated one of the 2012 Florida Gardens Select Plants by the Florida Nursery, Growers, and Landscape Association, ‘Gracilis’ is a shorter textilis clone that is also a more vigorous shooter than other textilis varieties. Its size and vigor give it a full and balanced look and make it one of the best choices for privacy screens in our climate. One of our favorite clumping varieties overall. Luxuriant tropical foliage. Recommended for hardiness zones 8b and above. Dwarf textilis Bambusa textilis ‘Dwarf’ 18 1.3 15 5 The shortest of the textilis varieties, with classic textilis appearance. Hardiness zones 8b and above. Royal Bamboo Bambusa textilis ‘Kanapaha’ 50 2.5 15 5 Kanapaha is perhaps the most beautiful of the clumping varieties that are evergreen in zone 8. It is a larger form of textilis that has a beautiful bluish bloom on new canes and also has the lush foliage typical of the textilis varieties, but with larger, longer leaves. On larger plants, the lower half of canes will be branchless, showing off the blue coloration of younger canes. We are still waiting to see what its mature height will be here, but looks as if it will approach the 50 foot mark it hits further south. Kanapaha may be the tallest clumping variety for zone 8b. Its name comes from Kanapaha Gardens in Gainesville, Florida, where the largest known specimen is growing. Highly recommended. Hardiness zones 8b and above. Emerald Bamboo Bambusa textilis ‘Mutabilis’ 35 2 15 5 Similar to and may be the same clone as ‘Kanapaha.’ Hardiness zones 8b and above. Clone X Bambusa sp. ‘Clone X’ 75 2.8 21 5 Identity is uncertain, but may be a form of B. ventricosa. Grows larger and is more cold-hardy than standard ventricosa. Mostly deciduous in our area. Hardiness zones 9 and above; perennial in zone 8. Painted Bamboo Bambusa vulgaris ‘Vittata’ 50 4 30 5 Golden yellow canes with green stripes that look like drip marks. A very popular ornamental further south, it is a container plant for us. Dwarf Buddha Belly Bamboo Bambusa vulgaris ‘Wamin’ 16 3 30 5 Has a more consistent Buddha’s Belly form than B. ventricosa, but is less hardy. Makes a great container plant for us, but needs to be brought indoors during the winter. Rufa Fargesia dracocephala ‘Rufa’ 6 .5 -5 2 ‘Rufa’ is the most cold-hardy of the clumping bamboos that we grow. While most of the Fargesias can’t take our hot and humid summers, ‘Rufa’ so far has shown no ill effects, although it does require a shady spot to thrive in our area. If you want a clumping bamboo, but are too far north to grow the Bambusas, try this one! Mexican Weeping Bamboo Otatea acuminata ssp. aztecorum 20 1.5 23 4 Long, narrow leaves and open clumping habit give this bamboo a beautiful, distinctive look. Prefers a drier site than most tropicals. Depending on the microclimate where it’s planted, this bamboo is partly to completely deciduous in our area, but makes a great perennial plant. Hardiness zones 9 and above; perennial in zone 8. 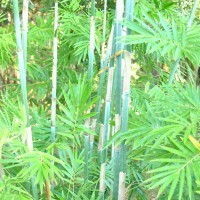 Tropical Blue Bamboo Bambusa chungii 30 2 21 5 Thin-walled canes are covered with a persistent bluish bloom. A very popular ornamental in central and southern Florida, we are evaluating its performance in our climate. So far, it appears to be a little hardier than listed and has remained semi-evergreen through several nights at 15 degrees F in a protected microclimate. AKA Emperor’s Blue Bamboo and White Bamboo. Barbie Bamboo Bambusa chungii ‘Barbelatta’ 22 1.5 21 5 A smaller version of B. chungii, and quicker to recover from cold-damage, thus better-suited for North FL and south GA than standard chungii. Also a more vigorous grower than standard chungii. Bambusa dolichomerithalla ‘Silverstripe’ 35 2 25 5 Green culms w/vertical silver striping. Tight clumping and vertical with beautiful foliage. Has survived several 18 degree nights with minimal leaf burn in a protected microclimate. The same plant was completely top-killed at 15F, but is recovering nicely. Bambusa dolichomerithalla ‘Greenstripe’ 35 2 25 5 Similar to ‘Silverstripe’ above, but with yellow-green canes and dark green vertical stripes. Asian Lemon Bamboo Bambusa eutuldoides ‘Viridivittata’ 25 1 21 5 Yellow canes with dark green striping. Low branching. May be hardier than listed. We are evaluating this one for suitability to our climate. Fernleaf Bambusa multiplex ‘Fernleaf’ 20 0.5 12 5 Beautiful, fern-like foliage. May revert to the mother form on shady or moist sites. Fernleaf Stripestem Bambusa multiplex ‘Fernleaf Stripestem’ 12 0.5 12 5 Similar to ‘Fernleaf’, but canes are yellowish with green striping. Hirose Bambusa sp. ‘Hirose’ 55 5 21 5 Similar to, and possibly, the same as B. oldhamii. Buddha’s Belly Bambusa ventricosa 55 2.3 21 5 Will only develop the Buddha’s Belly form when grown in pots under dry conditions or, more rarely, in the ground on dry sites. Popular as a large screening plant further south, we are waiting to see what its maximum height will be here. Kimmei Bambusa ventricosa ‘Kimmei’ 55 2.3 21 5 Same as ‘Ventricosa’, but has yellow canes and green stripes.